Featuring the sounds of small to medium-sized hand drums, Jungle Loops is stocked with tuned and untuned percussion sample loops, phrases and fills that instantly create an ethnic feel in any production. The rhythmic patterns in the software range from minimal to busy. Each instrument has various elements that can be recombined and auditioned. Jungle Loops can also be tweaked and transformed to fit your needs. The step sequencer and key switches can make sounds half, normal or double tempo, as well as insert a variety of FX (which includes filter, lo-fi, distortion, flanger, phaser, delay, reverb and a limiter). 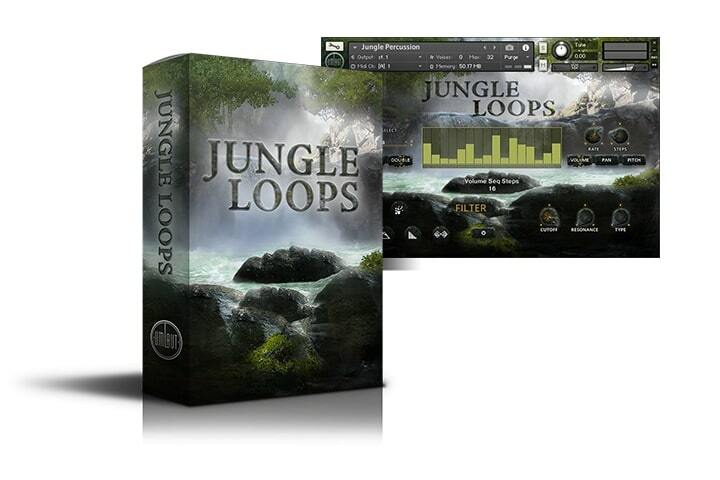 With a simplistic interface and appealing design, Jungle Loops is a straightforward and functional sample library for any composer or sound designer. ‍780 MB SAMPLE LIBRARY CONSISTING OF LOOPS, PHRASES AND ENDINGS. ‍PATTERNS RANGE FROM SIMPLE AND MINIMAL TO BUSY. ‍RECORDED WITH LIVE PERCUSSIONISTS AT STUDIOS IN LOS ANGELES AND BANGALORE, INDIA. ‍STEP SEQUENCER FOR VOLUME, PAN AND PITCH.